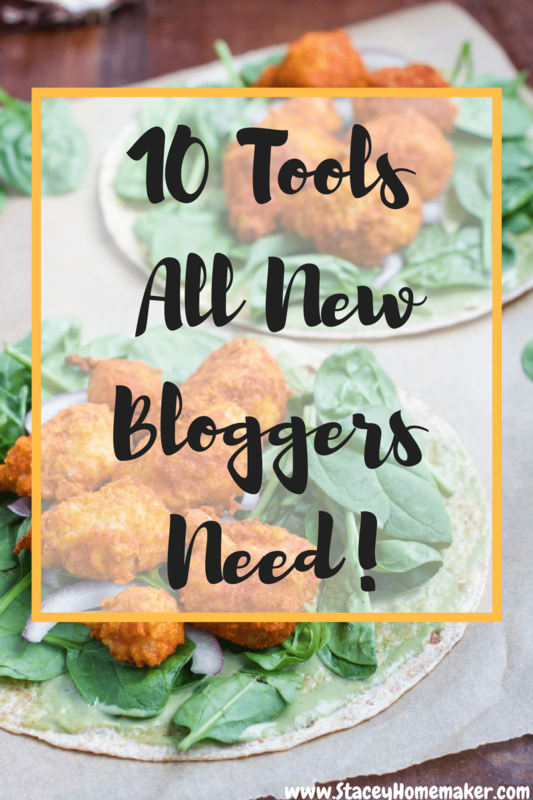 10 Tools All New Bloggers Need! This post if for all the new bloggers who just started their website! You’re ready to dive in, but wait! Don’t make the same mistakes I did, learn from my losses and save yourself a lot of time and heart ache! Start your website with a strong foundation so it can grow quickly and you can start making money! I use every single one of these tools for my website. I know it seems like a lot to take in, but just take it day by day. Eventually, using all these tools will become second nature to you and you won’t know how you ever blogged without them! If you need help deciding what hosting company to go with, I can highly recommend Siteground. It’s been a dream working with them. If you need step by step instructions, check out my “How to Start a Food Blog” post. StudioPress Foodie Theme – After I installed the Genesis framework, I chose the Foodie theme for my food blog. I know, how original of me. It’s called that for a reason though- the way it’s setup puts your recipes on display for the world to see! I started my blog using my pocket-sized power shot camera. Needless to say, I wasn’t happy with the results. The picture on the left was taken with my first camera and the picture on the right was taken with my new camera (that I LOVE and still use to this day!). I had no idea what I was doing back then so the picture is way over-exposed and not styled at all. But if you look past all of that, the quality of the picture on the left is clearly lacking. The picture on the right is crisp, clear, in focus, and frankly, it’s making me very hungry! That’s exactly how I want everyone to feel when they look at it too! 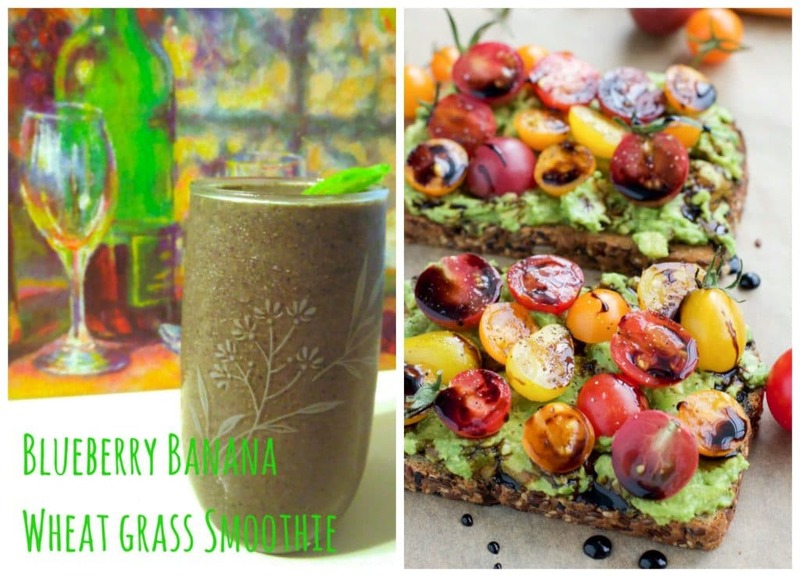 The pictures of your food is what will draw people in and send them to your website. Invest in yourself and get yourself a good camera! I waited a few months before I took the leap and I’m so glad I didn’t wait any longer. My pictures improved as soon as I started using my new camera. When I purchased my new camera, I also bought this lens. I picked this one because it’s the one all of my favorite food bloggers used and recommended. I wanted my pictures to be just as good as theirs, so I bought it and never looked back. It completely changed the way I took pictures. This lens lets you take amazing close-up shots of the food you’re photographing. I also have a zoom lens but this 50mm 1.4 lens is my favorite for creating drool-worthy food photos. I loved practicing daily with my new camera and lens but quickly realized that my old memory card could only hold about 100 pictures while I was shooting in RAW (to capture all the pictures details). It was very frustrating to have to stop every 100 pictures, load them to the computer, delete and pick up where I left off. I don’t even want to think about the times I was out and about with my camera and I had forgotten to load the pictures so I had to delete good ones to make room. Ugh.Do yourself a favor and get a bigger memory card.I never run out of room with this mac daddy memory card! 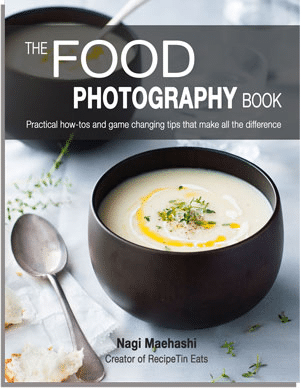 I felt like I had already taken so much time trying to teach myself how to customize my website that I didn’t want to lose any more valuable time trying to teach myself about food photography. I needed resources that had all the information ready for me to devour.I learned so much from these three books, the amount of information packed in them is insane! Lightroom/Photoshop – After a year of using the easy photo editor that comes with iPhoto, I started getting frustrated because I couldn’t get the colors or brightness in my photos exactly how I wanted it to look. I didn’t think I could afford Photoshop because I thought you had to buy the whole package.I finally looked into it when a fellow food blogger posted about how she just bought the Adobe monthly subscription for only $9.99 a month! I was so excited because I could afford less than $10 a month to edit my pictures professionally. I’m still learning to use Photoshop but I use Lightroom on a daily basis. There are plenty of tutorials on youtube to help you learn it. The first recipe (Twice Bakes Sweet Potatoes with Balsamic Onions & Goat Cheese) that I edited using Lightroom is now one of my most popular recipes on my website! I 100% believe that’s due to using professional editing tools! Canva + PicMonkey – Once I felt that my pictures were getting better, I wanted to work on my Pinterest presence.To gain more followers, you need to share your own work along with pinning other bloggers content multiple times (I’ll share my Pinterest power tools in the next step) during the day. Make sure you’re only pinning bright and beautiful images that catch your eye. Pinterest loves bright, beautiful, vertical images and the long pins that have multiple images. Here’s the tutorial that I used to learn how to make the long Pinterest images. (free) one picture (hero shot + text) images (picture on the left) and I use PicMonkey to create the (free) long multiple image pins (picture on the right) for Pinterest. The better your pictures look on Pinterest the more likely it will lead to them being re-pinned more. More re-pins = more eyes on your recipes = more traffic to your website! Note – In my experience, small horizontal pictures don’t do well on Pinterest. I usually pin my hero image (the image I start my post with) and my long Pinterest image to my #1 Pinterest board —> Most Pinned on Stacey Homemaker. BoardBooster – BoardBooster was a huge game changer for me. I didn’t have time to sit at the computer for hours going through Pinterest looking for recipes to pin. I also didn’t have to time to pin my own material day after day at peak times. I needed a way to automate this task! BoardBooster has nearly tripled my Pinterest traffic by pinning to my group boards 60+ times per day for me. It takes a little bit of practice to get the hang of it but once you get in a routine of using it– it’s very simple to use. If you’re looking for group boards to join– search here first. It’s where I found most of the groups I’m currently part of. I just started using BoardBooster last year. I was very confused trying to learn how to use BoardBooster in the beginning, it almost feels like you have to work backward if that makes sense. I don’t know why but it felt like I was trying to learn another language. I’ve already started to see the benefit of using it after one of my pins went “mini viral” (20k repins in one month) after being pinned by a bigger pinner from one of the group boards I pin too. I also love their pin sourcing tool. It’s really convenient to be able to set the type of pins you’re looking to pin and it goes out, finds them for you, and pins them at the speed you choose. Awesome! I followed RecipeTinEats and SpendWithPennies tutorials to learn how to use BoardBooster. Both posts are so helpful and they really broke it down in a way that I could understand how to use BB to my advantage. Click here to start your free trial of 100 pins on BoardBooster. Thankfully, I was able to restore most of my website and only have to re-do a few of the recent posts. It could have been much worse. I will never leave my blog unprotected again! Too much hard work goes into it to not back it up. I hope that these 10 tools help being a new blogger a fun and rewarding experience! Blogging is hard work, it takes time and dedication to get it off the ground but it’s so worth it! I wouldn’t trade my blog for anything else and I feel so lucky that it’s my job. You might feel like giving up– I sure did. Don’t do it, keep pushing! You’ll figure out that super confusing code or the 500 steps that it takes to customize a tiny button on your website. You can do it! If you need help or have any questions, feel free to contact me. I’ll do my best to help. Good luck!